The goal of this technical article is to give you an insight into one of the cornerstones of PopcornFX : its scripting system, and shed some light on how we manage to keep performance high. 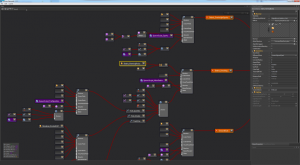 Scripting seems like the natural solution to make a powerful and versatile FX system, that doesn’t limit artists to predefined hardcoded sliders and properties. Scripts are at first a simple expression that takes any number of nodal input “pins” referenced in the expression as “$1”, “$2”, “$3”, … , “$n”, and evaluates to a single (vector) value, no function structure. First version of the parallel vector VM that executes scripts. After halting development for two years, decision is made in 2010 to make an fx middleware, named “HellHeavenFX”. It keeps the nodal representation under the hood, but displays it as a simpler treeview to hide the underlying complexity, all subsequent 1.x versions keep working this way. 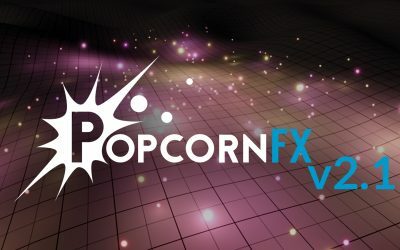 “HellHeavenFX” is rebranded to “PopcornFX”. 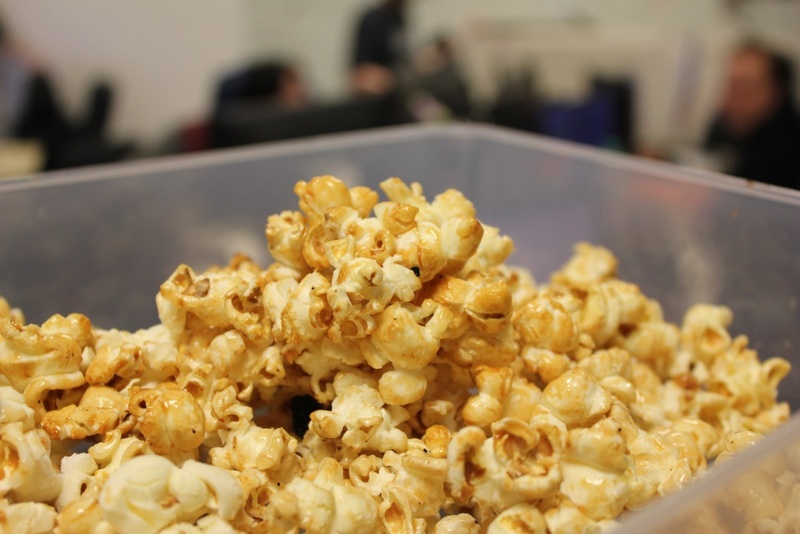 Gives us an excuse to stuff our faces with popcorn every time there’s a party at the office! It introduces a GPU backend in addition to the old (2008) CPU backend : We find out making popcorn run on the GPU is actually a piece of cake, thanks to the initial design. Initial GPU simulator written from scratch by 1 developer in ~2 weeks time. Iterated on and tweaked from time-to-time over the following months. Although unintended when initially designed back in 2008, the script execution model translates naturally to the way current-gen (2015) GPUs work, and performance is excellent from the start. 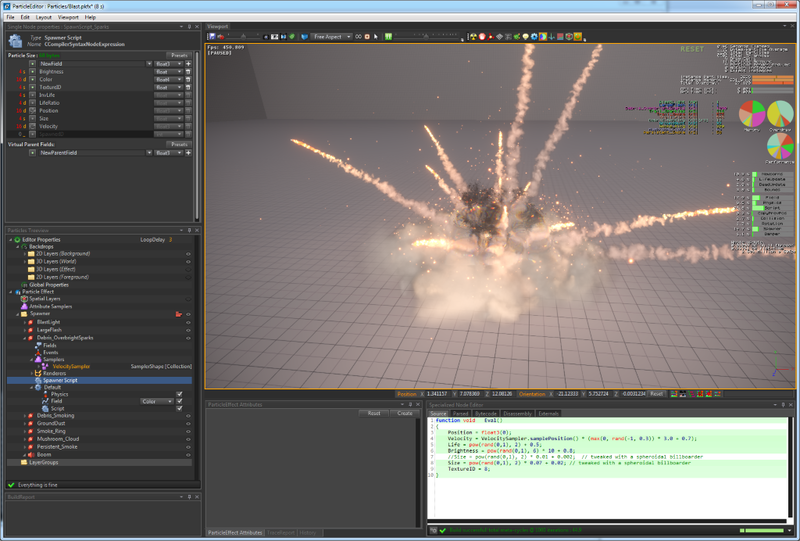 On the left, “Blast.pkfx” again, On the right, an effect running on the GPU. 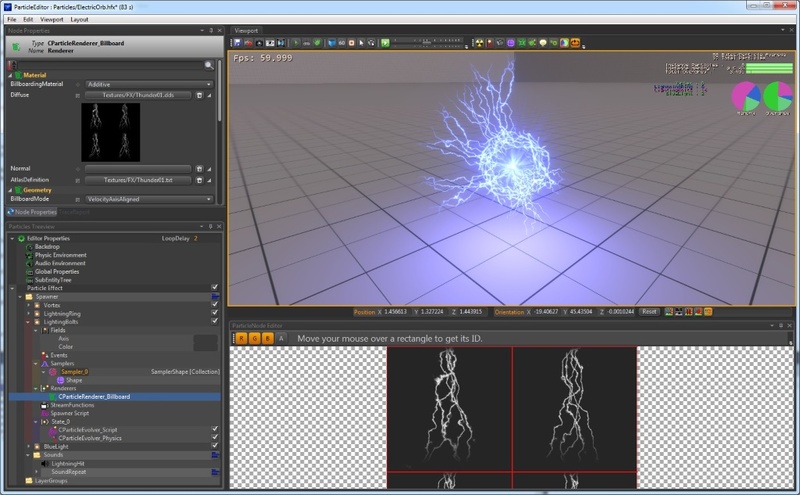 v2.0 goes back to a nodal view, pretty different from the original 2008 nodal system, nodes and script nodes will be merged together under the hood into an unified script, condenses all we’ve learned from more than 8 years of almost exclusively working and experimenting on particle effects, as well as the community feedback. 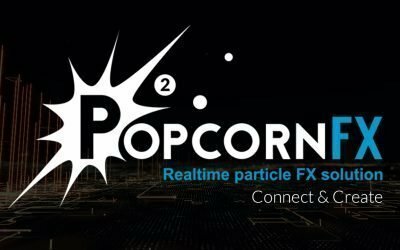 A PopcornFX script is usually a simple function that reads and writes particle properties, and performs a bunch of computations. Like shaders where you manipulate a single pixel or vertex, PopcornFX scripts let you manipulate a single particle. However, we usually don’t have a single particle to run the script on, we have many. a store to store the color back to the particle storage. SISD stands for Single Instruction, Single Data. This is the execution model used by regular CPU instructions. Cons: Excessive per-particle overhead when executing the script, poor usage of CPU’s execution pipeline and resources. Slow. SIMD stands for Single Instruction, Multiple Data. In this model, we run the script on blocks of 4 or 8 particles to take advantage of the CPU’s SIMD vector instructions. Each instruction processes 4 particles if running on an SSE-enabled CPU, 8 particles on AVX-enabled CPUs. Run each instruction on all particles, then jump to the next instruction. Pros: good usage of CPU resources, the code that executes each instruction can be efficiently unrolled and use SIMD instructions, very low per-instruction VM overhead. Pros: very efficient, naturally parallelizable on worker threads. Solves all the performance issues of the previous methods. Cons: dynamic flow control (if/else/loops) harder to implement, not yet supported. 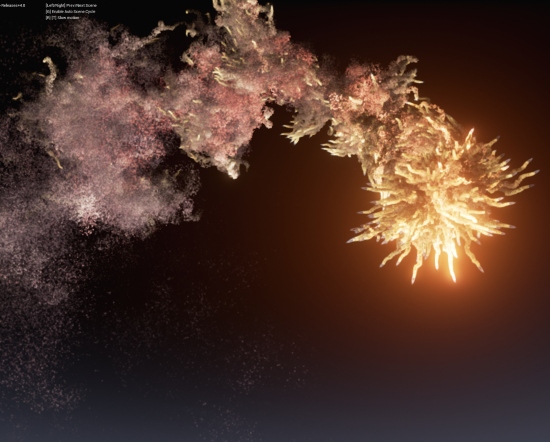 One C++ class/object per particle, with virtual update and render methods. Pros: Relatively easy to add / remove particles, simple to code. 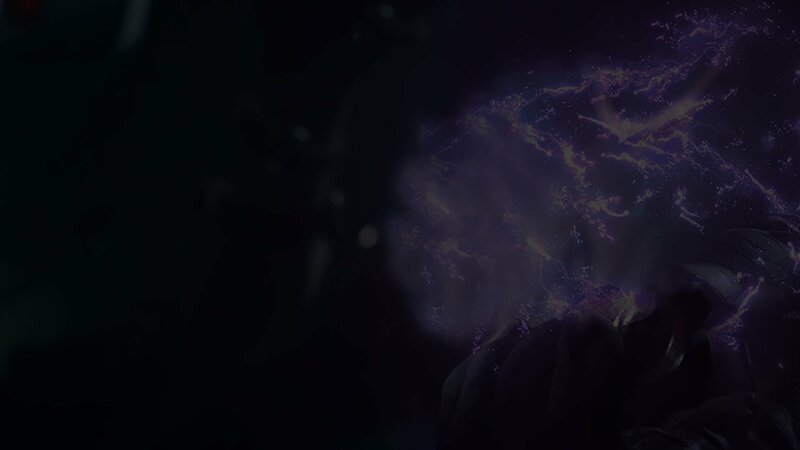 Cons: This is probably the worst ever way to implement a particle system. 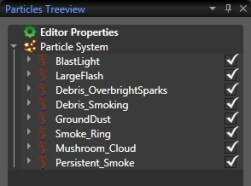 Don’t laugh, I mention this because I’ve seen it actually used in production in two games a couple years ago, that had their own in-house particle engine (and unsurprisingly, performance issues related to particles). One of them used a linked-list of particles (! ), the other one used an array of pointers to those objects. Please don’t do that. Each particle is a tightly packed data structure containing position, size, life, velocity, etc.. 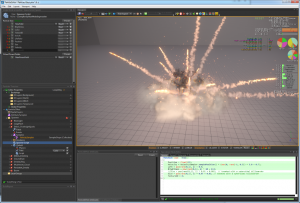 The update and render functions loop on this array and process the data for each particle. Cons: Inefficient if running a single script instruction for all particles, can’t coalesce loads together with SIMD instructions (except on the rare platforms that support strided/gather loads), CPU pays the cost of touching all cache-lines even if some particle data is “colder” than some other (“cold” data meaning it isn’t needed as often as “hot” data). Also harder to make flexible code-wise, usually either a big fat “uber-particle” structure is used, containing all data needed for all particle types in the game, which makes cache issues worse due to even more cold data, or code needs to handle multiple structures for different particle types, and this leads to code duplication, which leads to maintainability issues, bugs, and potentially sub-optimal instruction-cache usage. Pros: Efficient with the stream execution model, allows aggressive unrolling and very efficient data processing. Cons: When reading/writing all lanes of a multi-lane field like Position, usage of more x86 load/store buffers and write-combine buffers might affect performance. Also sometimes dubbed “SOAOS”. Here vectors lanes are not split in different arrays. Instead, the float3s are stored contiguously in memory, in an xyzxyzxyzxyzxyz fashion, instead of xxxxx yyyyy zzzzz for pure SOA. Initial model of v0.1 (2008), still used today. Pros: makes parts of the code easier to maintain, Might also help cache when loading many data streams in parallel. Operations that do not require knowledge of the different lanes can treat the whole stream as a flat array of independent values (ex: multiplication, addition, etc..), which makes it slightly more efficient than processing three separate arrays. Cons: makes some other parts of the code less easy to maintain. To be efficient, some computations need to transpose the data back to pure SOA, compute their stuff, then transpose it back to hybrid form to store it back in the storage. This is inefficient. Like with the Hybrid SOA/AOS format, there is a single array for vector values, however, the xyzw lanes are pre-transposed inside the array, by smaller batches, whose size is usually equal to the hardware’s SIMD vector-width. Pros: avoids transpositions when loading the data for processing, and merges the benefits of both SOA and hybrid SOA, by making the unroll of processing loops even easier. 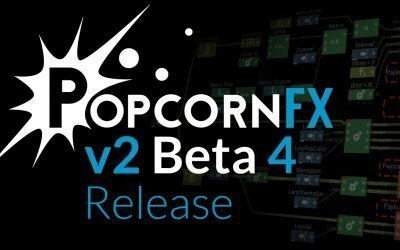 PopcornFX uses the Hybrid SOA / AOS memory model since its first version, mainly due to legacy reasons. We might switch to one of the two other SOA methods in the future if we see a real measurable performance benefit in doing so. In a current-gen GPU, each shader-core / compute-unit runs shaders on batches of 32 (NVIDIA) or 64 (AMD) elements, for example, 64 pixels or vertices simultaneously. These batches are named “Warps” on NVIDIA GPUs, and “Wavefronts” on AMD. two different names, but they’re the same thing. Each element of a warp or wavefront is called a “thread”. 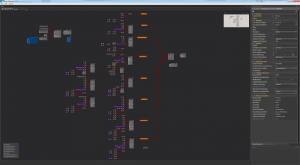 The shader controls a single element (pixel/vertex/etc), and inside a single wavefront, all threads execute the same instruction at the same time. There is a single instruction pointer for all of the 32/64 threads. And there effectively is a single instruction executed, that processes 32/64 elements at once. When processing a wavefront, the GPU has two kinds of registers available: SGPRs (Scalar General Purpose Registers), and VGPRs (Vector General Purpose Registers), which hold intermediate values computed by the shader. Unlike traditional CPU-style SIMD where you’d store a float4 color inside a 4-wide SIMD register, GPUs adopt an orthogonal view (see “Streamed SIMD execution model” above), where each float4 is actually stored inside 4 VGPRs across the 64 elements of the wavefronts, one for each of the xyzw lanes. This matches exactly the pure SOA memory model (see above). So unlike on PC where SIMD registers contain 4 (SSE), 8 (AVX), or 16 (AVX512/KNC) floats, each VGPR contains 32 floats (NV), or 64 floats (AMD). Dynamic flow control (if/else/loops) is more complex due to the notion of “divergence” between threads of the same wavefront, that breaks the “single instruction pointer” paradigm, and we won’t cover it here, if you’re interested in the subject, see this excellent article about wavefront divergence, written by Tim Foley. 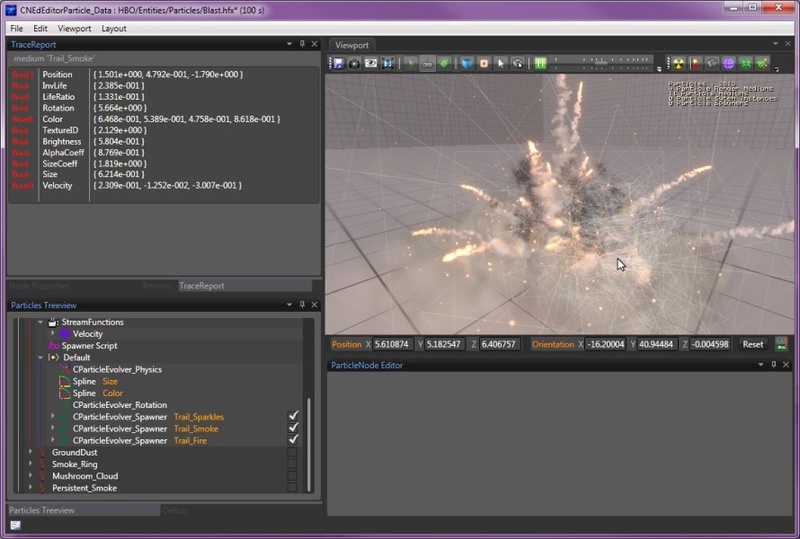 You can basically see the PopcornFX script CPU backend as a sort of simple GPU emulator, with even fatter wavefronts. Where GPUs have compute-units, CPUs have cores. 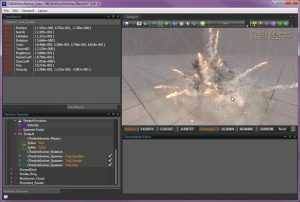 PopcornFX uses threads to parallelize script execution on each CPU core, just like the GPU parallelizes wavefront execution on multiple SIMD units and compute units. and reason about a single per-particle position, ray direction, and ray length, the actual C++ intersect function gets called with an array of positions, directions, and lengths, where each of those three arrays will have the size of the current wavefront. Each value and operation in a script has a type (ex: float, float3, int4, ..), but also an independent “Meta-Type” (also sometimes named “Frequency”). 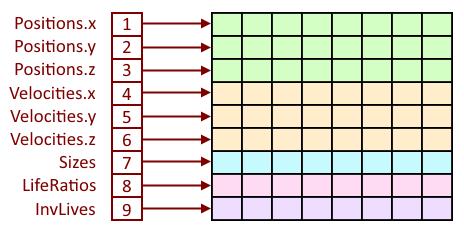 This meta-type represents the variation frequency of each value. For example, the Meta-Type of “4.5” is “Constant”. The Meta-Type of “scene.Time” is “Normal”. The Meta-Type of an effect attribute is “Instance”. The Meta-Type of a particle field, like “Position”, is “Stream”. Does not change during execution, can be precomputed at compile time. Ex: numerical constants, scene.axisUp(), scene.axisForward(), etc..
Meta-Types allow the script backend to perform less computations. For example, all ‘Normal’ operations can be run once per frame or once per wavefront, instead of once per particle. This is equivalent to GPU’s SGPRs, whereas the ‘Stream’ Meta-Type is equivalent to VGPRs. Meta-Types are propagated through operations, and the Meta-Type of the result of an operation is at least the highest Meta-Type of its input values. Therefore, as soon as you’re doing operations with a stream value, every operation can very quickly become streams as well. For this reason, the script compiler also tries to reorder operations based on their meta-types to optimize computations even more. This can be seen as an equivalent to regular compiler’s optimizers pulling loop-invariant computations outside of inner-loops. Each instruction’s Meta-Type is visible in the ‘disassembly’ tab of the script editor, on the leftmost column. It’s the combination of all those techniques that keeps overall performance high. When you create a PopcornFX script, the compilation pipeline goes through 3 different stages before it produces the final executable representation of the script that can be run by the runtime: The frontend, IR (Intermediate Representation), and backend. 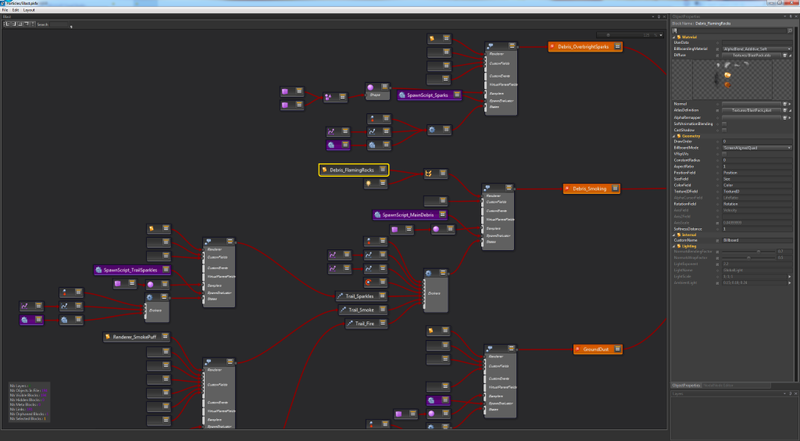 Parses the script, builds an AST (Abstract Syntax Tree), that’s basically a node-graph of all operations typed in the script. Bubbles-up lower meta types up the evaluation branches whenever possible. Computes operations with constant operands at compile-time. Able to call C++ functions that have constant parameters at compile-time. Before v1.10, there was no real IR, and the AST was sent directly to the backends for them to build their final executable bytecode. Since v1.10, an IR is generated in SSA form (Static Single Assignment). Stands for “Compiler Backend EMulation” : Is given the IR (v1.10 and above), or the AST (before v1.10), by the previous stage in the compilation pipeline, and builds a runtime representation of the script as a sequence of instructions. Performs a simple register allocation to minimize the number of total registers needed. Stores those instructions in a condensed bytecode format. The CPU backend also contains the VM (Virtual Machine) that will decode the bytecode and execute the instructions. Stands for “Compiler Backend D3D11” : Like CBEM, is given the IR, and generates a D3D11 compute-shader. 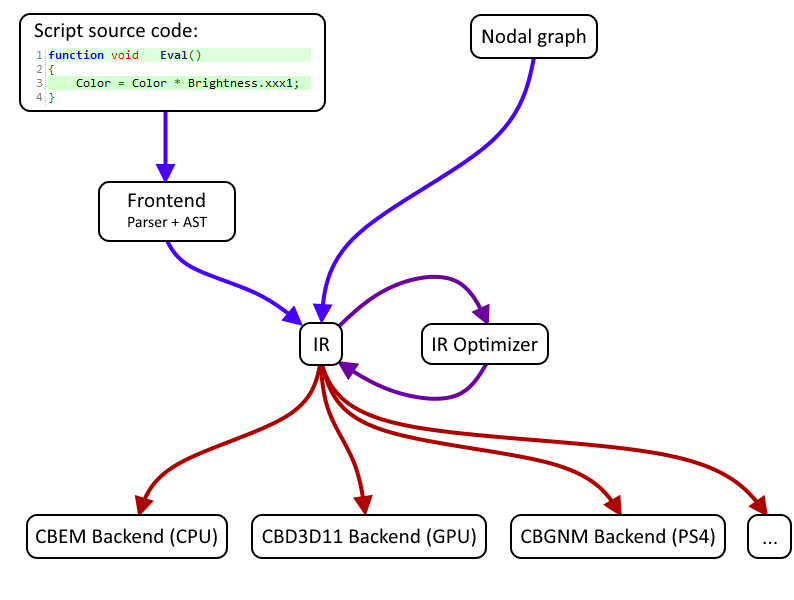 With v2.0, the nodal graph counts as a different front-end, that produces the common IR, and can be merged with the IR generated from script nodes, this allows very powerful inter-evolver optimizations, that were not possible before.